﻿ . . . locative art. 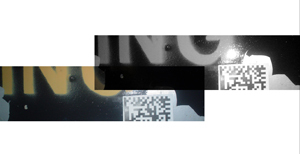 . .
An augmented reality walking tour using 2D barcodes placed at various locations around Boston, accessed via cellphones. web021... invited the participant to reflect on the combination of technology, narrative, nature, and fantasy that produce the experience of place. web021... is a city-wide walking tour of the real "social web." Using stickers, cellphones, and 2D barcodes, web021... challenges the viewer to peek under the construction of daily life to reflect on his or her own role in that construction. 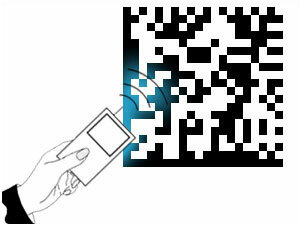 Each sticker refers to a different URL; to activate a sticker, simply point your cellphone at the 2D barcode, or send a text message to the email address provided. A message will be returned to your phone. There is no strict route to the walking tour, the idea is to come across these stickers somewhat randomly and by surprise. 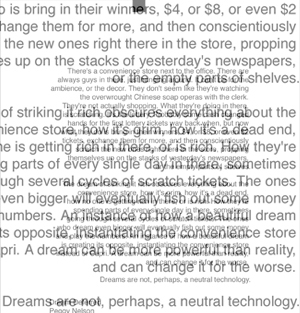 A sticker might appear near your supermarket, or on a streetlight near the T.
The messages invite the viewer to reflect on the combination of technology, economics, politics, and fantasy that produce the actual experience of a place, as well as the forces that attempt to package that experience, and sell it back to you. web021... highlights the importance of individual experience, and the strength of the virtual component of actual locations. The virtual has inhabited the real since we have been able to tell ourselves stories and leave pictorial signs; long before VR, 3D avatars, and the web. web021... re-activates the secret history of our virtual heritage, locates its presence in the physical environment, and hints at how much of that might be available for individual creative manipulation. The installation will be up city-wide throughout 2007.